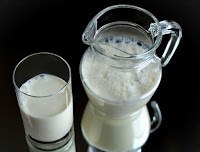 This is the answer of most people when it comes to drinking milk,milk is also important,especially in the growing age whether you are a child or above 40.Milk builds calcium in our body which construct strong bones,milk is essential for the children and at the same time for those who have crossed 40,bones are getting weak in the growing age,especially women after 30,so womens should take great care of calcium diet.So let's know if you do not like to drink milk then what you can do in this place. If you do not like to drink milk,then you can add curd to your diet.In the curd (Dahi),calcium is found in good quantities which build strong bones,curd rich in calcium with protein can be a better option for you. You can also include cheese in your daily diet,there is also a good amount of calcium as well as protein.You will get about 208 mgs of calcium in 100 grams of cheese and about 15 grams of protein. Almonds loaded with highest amount of calcium.Protein is also rich in it.It also decreases the risk of heart diseases.Almond also helps in enhancing your memory.According to an estimate,about 100 grams of almonds contain about 264 mg of calcium and 21 grams of protein. Calcium is also abundant in figs with fiber and potassium which strengthening your bones.According to an estimate, you get 35 mg of calcium in 100 g dryed figs.Dried figs are a good source of calcium, copper,magnesium,iron,selenium and zinc. Green leafy vegetables are a very good source of calcium.Therefore add green leafy vegetables to your diet.Vegetables,mustard,broccoli,spinach,cabbage etc provide you plenty of calcium.100 grams of green leafy vegetables contain calcium from 100 to 190 mg. Beans are considered to be a good source of calcium.Apart from calcium there are proteins,fibers and many other essential nutrients. Oatmeal contains calcium,potassium,vitamin B-complexes and magnesium.At the same time there are both fiber and calcium in good amount.Which are helpful in strengthening bones.If possible then it must be eaten in the morning breakfast.